Question #63: Briefly discuss “reconciliation” in the New Testament utilizing three Greek words. 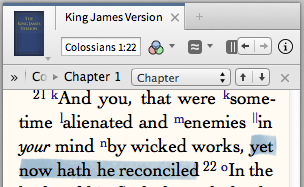 We needed reconciliation because we were enemies of God. 3) apokatallasso, and intensified word meaning “to completely change” (Eph 2:16). “For if, when we were enemies, we were reconciled (katallaso) to God by the death of his Son, much more, being reconciled, we shall be saved by his life. 11 And not only so, but we also joy in God through our Lord Jesus Christ, by whom we have now received the atonement (“reconciliation” from katallage)” (Rom 5:10 and 11). “And that he might reconcile both unto God in one body by the cross, having slain the enmity thereby:” (Eph 2:16). 1 John Walvoord, “Reconciliation,” in Bibliotheca Sacra, 119:476, Oct 1962, pp. 291-92. Next Next post: Propitiation? Big Word. What is it?